Synthesis refers to the way a reader’s thinking changes and evolves as s/he reads. Technically, synthesis involves generating new ideas or perspectives by combining what is read with existing knowledge. It might involve taking what is read and transforming it into something else, such as drawing a picture of what was read or crafting a written response. Stephanie Harvey and Lynn Goudvis, authors of Strategies that Work, suggest that synthesis runs the gamut from taking stock of meaning to achieving new insights. There are many metaphors for synthesizing, from baking a cake to completing a jigsaw puzzle. In each case, the process involves combining ingredients or pieces to create something new. 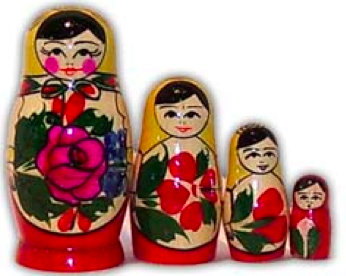 Tanny McGregor, author of Comprehension Connections, draws an analogy to the Russian stacking dolls pictured on the left. When we start reading, our understanding of the text is small and lacking in detail. But gradually our understanding grows bigger and bigger and becomes more and more complex, until, at the end, we have a grander, more elaborate “big picture” of what the reading is about. Summarize: taking a lengthy piece of text and creating a shorter version that sends the same message. Find the theme, message or main idea: distilling what was read into a single perspective or insight. Create text innovations: using the pattern, theme or structure of a text in a new way (such as fractured fairy tales). Recognize a “Eureka!” moment: noting the point at which all the pieces of the story come together, or when we figure out who dunnit, or when we recognize how what we have just read helps us understand our own world better. 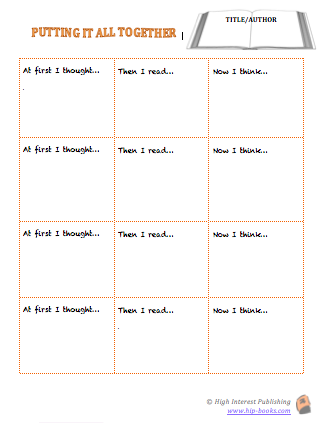 Click on the image below to download the graphic organizer (and a completed sample).